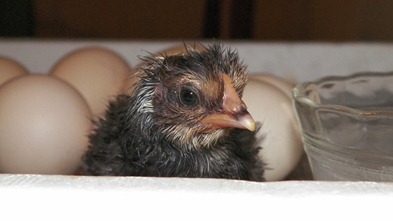 For the past 21 days, my son has been incubating chickens. He’s been rotating eggs every twelve hours for three weeks with only one reminder- an amazing feat for a 12 year old! We started hearing chirping in the house on Saturday night, and by the wee hours of Sunday morning, we had one baby. The next didn’t hatch until Sunday afternoon! Another followed it shortly. Yet another was really close, but had not made any progress in a very long time. We helped it along, only to find out that it had a very serious and pretty rare defect. We had no choice but to put it to sleep. Poor Ethan was so upset, but he understood it was for the best. Heck, even momma was upset! After 18 hours of hatching, we were sure that the other 4 eggs weren’t going to do anything (even though I thought I could feel them moving). When we got up this morning, there was a new chick in there! It couldn’t have hatched very long before. It’s been a great experience for Ethan- all of us actually. We were so excited to watch them hatch and care for them. I sure hope the rest hatch today!